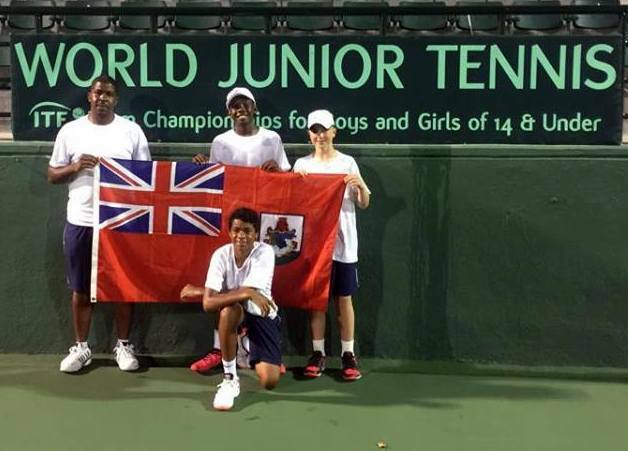 The Bermuda team of Antonio Warner, Bobby Bart and Mackai Whitter competing in the ITF World Team Junior Tennis Competition in Santo Domingo are now 2 & 1. Bermuda’s Under 14 Boys team are ranked 7th and are in Group A alongside number One Seeds Honduras, Suriname and Aruba. In their third game of the tournament Bermuda would take on the tournament number One Seeds Honduras and would go down 2 – 1. Honduras would take a 1 – 0 lead when Diego Sosa defeated Warner in straight sets 6-3, 6-2. Bermuda would draw level at 1 – 1 when Whitter defeated Guillermo Bennaton in a three hour and eight minute three set battle 7-6, 4-6, 6-0. The match would be decided in the Doubles as the Honduras pair of Bennaton and Antonio Chavez defeated Warner and Whitter in straight sets 6-3, 6-2.